In most organizations, DR is the quintessential complex, unfamiliar task. Disasters happen so rarely that recovery operations are the opposite of routine. What's more the myriad, interconnected data, application and other resources that must be recovered after a disaster make recovery an exceptionally difficult and error-prone effort. Even if you have never built a DR plan before, you can achieve great results. Just follow the DR Template that Janco has created and you will have a functioning plan before you know it. All Business Continuity / Disaster Recovery plans need to encompass how employees will communicate, where they will go and how they will keep doing their jobs. The details can vary greatly, depending on the size and scope of a company and the way it does business. For some businesses, issues such as supply chain logistics are most crucial and are the focus on the plan. For others, information technology may play a more pivotal role, and the Business Continuity / Disaster Recovery plan may have more of a focus on systems recovery. Backup Strategy for Data Centers, Departmental File Servers, Wireless Network servers, Data at Outsourced Sites, Desktops (In office and "at home"), Laptops and PDA's. Recovery Strategy including approach, escalation plan process and decision points. Testimonial - Dave Baker - City of Hamilton -I have found the DRP template invaluable! Testimonial - Bob Rifenbury -MCSE/CCNA Launch Testing Lab -The DRP Template saved me about 6 months of work! Testimonial - Kelly Keeler - Martin's Point Health Care -I have received and I began using the template immediately. IT IS GREAT! Made this process a snap for me. Cut my documentation time down from. weeks to hours! This document has made, what began to be an overwhelming process turn into a snap! Testimonial - Juan Stamos - Mexico City Corporation -We had a DRP in place, but needed a more user friendly structure. 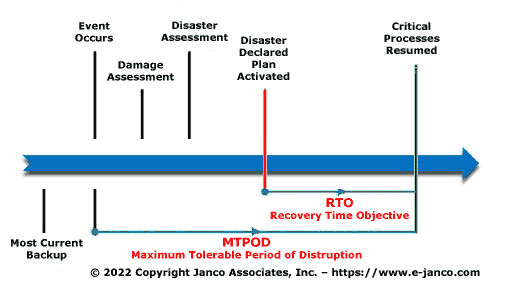 The Disaster Recovery Template (Gold edition) has that structure. It was very easy to quickly move our DRP into Janco's DRP Template -- a real added value.